Angelo was called home on July 7, 2018. He was predeceased by his maternal grandparents, Kokoh Sarah Cote, Chome Elmer Cote, his Uncle Alvin Cote, and numerous Cousins. He is survived by his loving mother Donna Deborah Cote ( Fred Kennedy), his father Fred McArthur (Donna), His special uncle whom he called "dad" Ivan Cote Sr also known as Mr. C. (Muriel Mae). He is also survived by his grandmother Monica Buffalo, his sisters Angela Cote (Shayne), Melanie Cote (Scooter), Kristen Cote, Sonia Bigeagle, Louise Bigeagle. His brothers, Ivan Cote Jr, Clint Bigeagle, Damon Delorme, Jason Bigeagle and Frederick "Charlie" Bigeagle. His Children, Dakota, Baby Angelo "AJ", Aidan, Cody, Fankie, Angel, Kael and Emery. His close aunts and uncles, Sylvia Popowich, Sally Benson (Willy) Esther Shingoose (Geno), Merlene Wuttunee, Shirley Cote, Colleen Brass (Eddie), Vivian Cote (Ryan), Angie McArthur (Bill), James McArthur, Wayne McArthur (Glenna). His close nephews Kaelem, Tristen, Tyrell, his close neices Shanice, Brooke and Mylee. Angelo is also survived by his numerous nephews, neices, cousins and many many friends and ATF’s that will all miss him dearly along with his special lady Amanda Missens. Angelo grew up in Yorkton with his Kokoh and Chome who he loved so much. Angelo had a soft loving spot in his heart for everyone, he had an amazing sense of humour. He was an incredibly smart, respectful "gentleman and a half". He always told everyone to love one another just like his kokoh did. 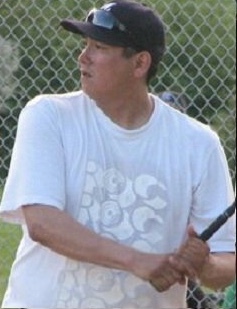 Angelo was a great athlete, he traveled across Canada playing slowpitch, winning MVP at the national level. He was always up for throwing the ball around or for having batting practice. He was known for always hitting home runs and in his words "making the trees whistle". He was a big Edmonton Oilers fan and no one was allowed to be Gretzky. He cheered for them by yelling at the TV. He loved his family and friends, he would always look forward to seeing everyone. At family gatherings he was always the chef, bbqing it up. He was always proud of everyone, and he had special nicknames for all his friends and family. Angelo was always encouraging and positive, he never liked drama and always wanted to get people together for a "gewd" time. He loved his music and was a "jazzy" dancer who had "moves like Jagger". He lived his life as stress free as possible. Angelo was the kind of person who knew how to do something but instead of doing it for you, he would teach you. He was a mentor,leader and all around role model. He always gave good advice and had the best interest of others at heart. Angelo loved to learn, he was always up to date on the news and was always up for discussing the world events. Angelo loved his name, to him he had the greatest name he could ever have and also the greatest nickname "Jello". He enjoyed his shows on HGTV, CNN and Discovery Channel but never looked forward to shark week. And now the air is shattered by the force, of Angelo's launch.